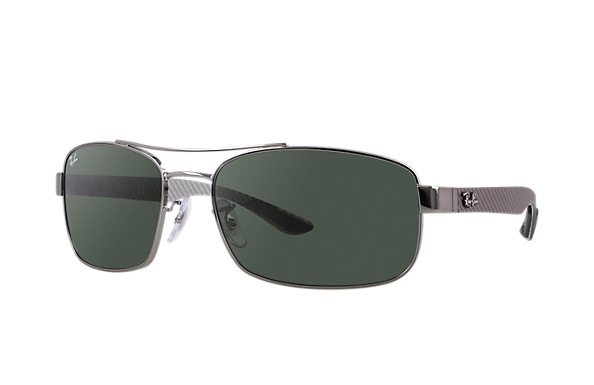 Ray-Ban RB8316 004 62-18 - A carbon fiber rectangular shaped unisex frame in gunmetal. The carbon fiber makes for extra comfort and a super lighweight finish. The frame comes with G-15 polarized lenses for extra clarity and protection. Ray-Ban RB8316 004 62-18 - A carbon fiber rectangular shaped unisex frame in gunmetal. The carbon fiber makes for extra comfort and a super lighweight finish. The frame comes with G-15 lensesthat work by absorbing 85% of visible light and blocking out most of the blue light, the green lens ensures better clarity of vision and remarkable colour contrast, providing a more 'natural vision'. Life through a lens though you won't notice the difference. The Ray-Ban RB 8316 sunglasses come with their own branded case, cloth and packaging, and all sunglasses are covered by the 12 month no quibble Sendoptics guarantee.